There are always several little things needed to create the “perfect” wedding celebration. Keep them simple and affordable, yet über chic, by creating paper embellishments. 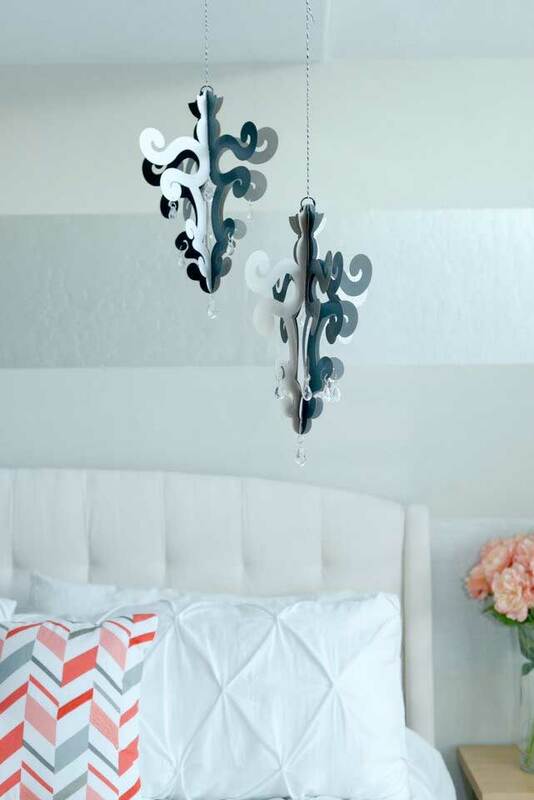 The paper chandelier can be kept as simple or as embellished as desired. Using the template cut four chandelier shapes. Score each one down the center. Layer all (4) chandelier shapes on top of each other. Temporarily secure them in place with binder clips. Sew the shapes together on the center score line. Remove clips. Punch a hole in the top and hang from a ring. Gently fan out the pieces. Put a jump ring through each of the jewels. Use a paper piercer to poke small holes in the chandelier where desired. Hang each jewel on the chandelier with another jump ring. Needle and thread can also be used to attach the chandelier pieces together. If unsure how to use a jump ring, check online at www.bluemoonbeads.com or www.youtube.com for a video tutorial. Change up the solid base to a printed base or add in colored beads tocustomize the chandelier design.